Today's #MeetTheMakerAP is Nicole Dallara of Crochet it Forward. I first met Nicole at a Book Club a few years ago and found out that we both shared the love of crochet and activism (having both worked at non-profit organizations for many years)! 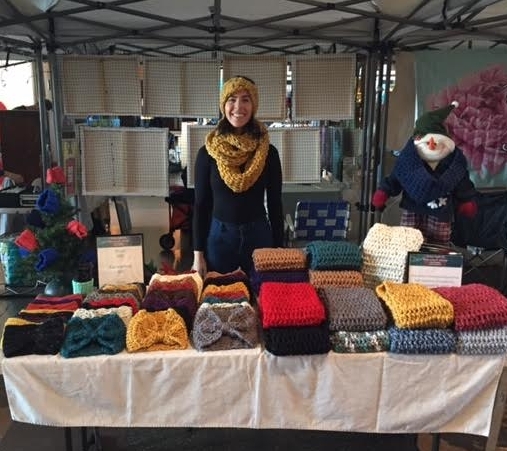 Nicole has now turned her passion for making a difference into crafting beautiful handmade ear warmers, scarves and cozies - and for each purchase she donates an ear warmer to someone in need. Keep warm and feel good this Valentine's Day - shop Crochet it Forward during our Valentine's Market on Saturday, February 11th! For years I have wanted to learn how to crochet. I was not fortunate enough to learn from my grandmother, but it was important to me that I keep the craft alive within the family. Finally I took a crochet class and instantly became hooked! I decided to turn my hobby into a mini business by starting Crochet it Forward back in 2013. I truly enjoy making items that people love and I know will keep them warm during the cold winter months. I grew up in Marlboro, but just recently bought a home in Keyport. Growing up in a suburban development, I was always attracted to towns where I can walk to and enjoy a “Main Street.” Keyport has an adorable little town center with a coffee and ice cream shop, restaurants and bars as well as a beautiful waterfront where a yoga class is hosted. As a self-proclaimed mermaid, I had to live near the water. Now I can walk down the block to sit by the water or paddle out on my SUP. To top it off I am a house away from the Henry Hudson Trail, which has got me hooked on biking. Men have their “man caves” and I have my woman cave. My workspace room is basically my hobby room. I have a desk and cubbies set up for my yarn and crochet items. It is also a yoga room with my mat, mandala on the wall and meditation area. It also just recently became my plant room with a tiny greenhouse where I am growing my seedlings. I am always excited to partake in the Asbury Park Bazaar. I love meeting and seeing what other makers are selling and I especially love meeting and talking to the people that attend the events. As a huge Beatles fan, I am especially looking forward to the Beatles cover band. By shopping small on Valentine’s Day, you buy a gift for someone you love that was made with love. Makers and small businesses owners truly love what they do, what better thing to do for Valentine’s Day and beyond than support love. For a year I have been talking about having a 70s roller skating party for my 30th Birthday. This year I was abroad for my birthday and couldn’t find a close rink to host a birthday party. I was ecstatic when I saw the Valentine’s Bazaar is having a 70s roller skating rink in Conventional Hall. I will be spending my Saturday night rolling into my 30s with all the loves in my life. 9) What is your perfect roller skating outfit? I already purchased my outfit! Let’s just say I went BIG in both sparkle and hair.